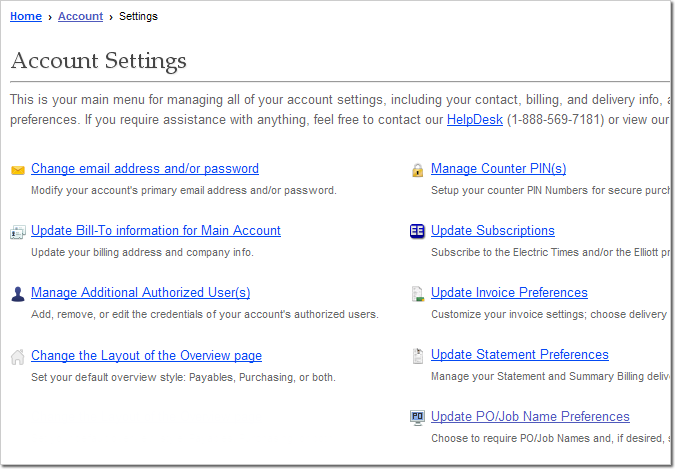 Below is an image of the main Account Settings page, where you can manage your login credentials, set up additional users, update your contact, billing, and Sub-Account information, customize preferences for invoices and statements, and more. To access your Account Settings page, be sure to log-in first, then simply hover your mouse over "Account" on the site's main menu and select "Settings." Each individual setting is discussed below in detail. If you're looking for a specific topic, you can select it from the menu on the right. Your Account Overview displays all of your account essentials on one screen. 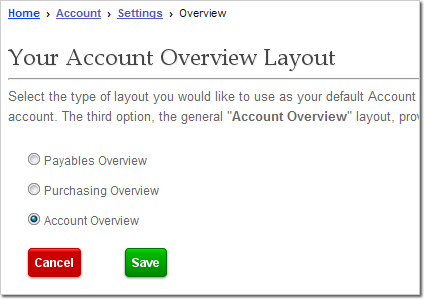 We offer three different default layouts designed to suit how you use your Elliott online account. The three layout options for the overview are Payables, Purchasing, and the general "Account" Overview, which combines tools for both Payments and Purchases. On the Overview page, you'll find links to recent invoices, orders, and quotes, along with summaries of your account activity. Your account balances and payment due dates are shown with their respective totals. By using the drop-down menu labeled 'Sub-Account,' you can select any individual Sub-Account and instantly view its balances, pending payments, pending transactions, and current purchases. You'll also find contact information for your Elliott credit and sales representatives, including email addresses, phone, and fax numbers. The Payables layout for the Account Overview provides a battery of tools associated with managing payments, including detailed invoicing and statement features. The Overview layout for Purchases offers Rapid and Bulk (copy-and-paste) entry for orders, a panel containing your custom lists, and a live listing of your recent transactions. 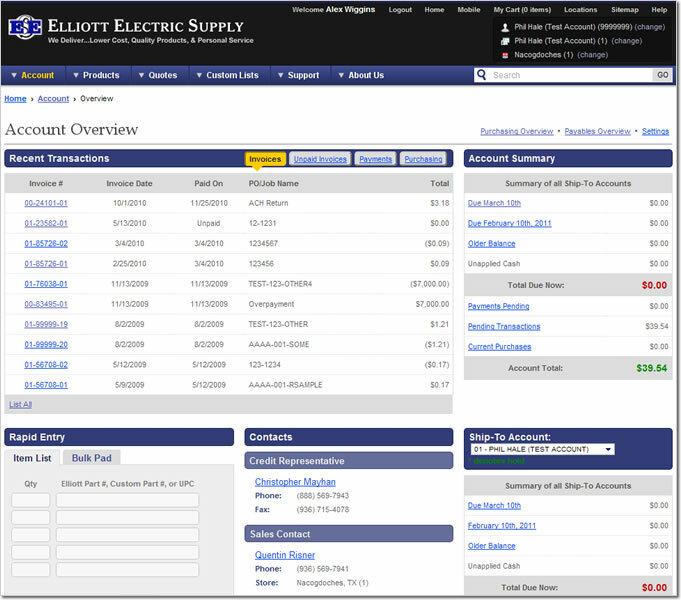 The general Account Overview layout offers a balanced combination of Payables and Purchasing features, including up-to-date lists of invoices, payments, and purchases, as well as Rapid and Bulk Entry. Click the "Change Email Address and/or Password" link on the main Account Settings menu (example image shown at the top of this page). 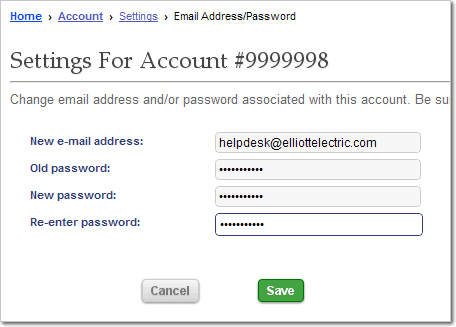 Then, enter the email address you would like to use, your current/old password, and your new password (twice, to ensure accuracy). Finally, click Save to make your changes effective. This page, accessed through Account Settings, allows you to maintain your account's primary Bill-To address, along with pertinent details like contact numbers, number of employees, and your business type. Access the 'Manage Users' page from the Account Settings menu. If you are the main account holder, you may add and delete users, as well as customize each user's access. To modify or delete an existing user, click the user name from the list (for example, the user named "Demo" in the image above). The modification page will include all of the same details that are available when adding a new user, with the addition of a "Delete This User" button. When you add a new user, or click an existing user's name to modify it, you will be able to update the following information: the user's name, the user's email address (which serves as the login ID), password, password expiration date, default shipping location and Sub-Account, the ability to switch to other Sub-Accounts, monthly maximum purchasing limit (dollar amount), and preset or customized access authorizations (as shown above). 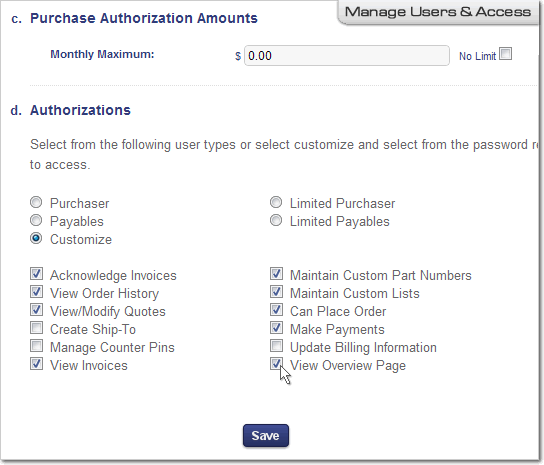 Authorizations can be any or all of the following access abilities: Acknowledge Invoices, View Order History, View/Modify Quotes, Create Sub-Account, Manage Counter Pins, View Invoices, Maintain Custom Part Numbers, Maintain Custom Lists, Can Place Order, Make Payments, Update Billing Information, and View Overview page. Be sure to click the Save button after you’re done editing a user. Accessed through Account Settings, the Counter PIN Number(s) Management page (master users only) allows you to add, edit, and delete the secure PIN numbers used to make account purchases in our physical stores. All counter purchases charged directly to your account must be authorized with a correct PIN number. This page is the ONLY place where PIN numbers are created and/or maintained. Required entries include the actual PIN Number, the authorized purchaser's name, and the PIN's expiration date. 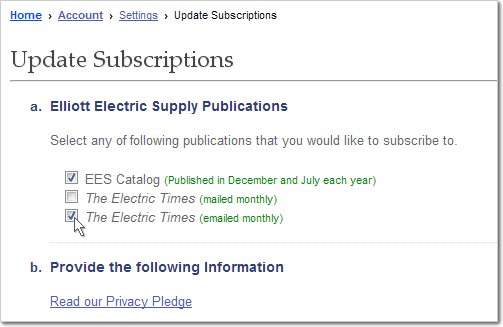 Also accessed through Account Settings, the 'Update Subscriptions' page allows you to subscribe to the EES bi-annual catalog and/or the monthly Electric Times via mail and/or email. 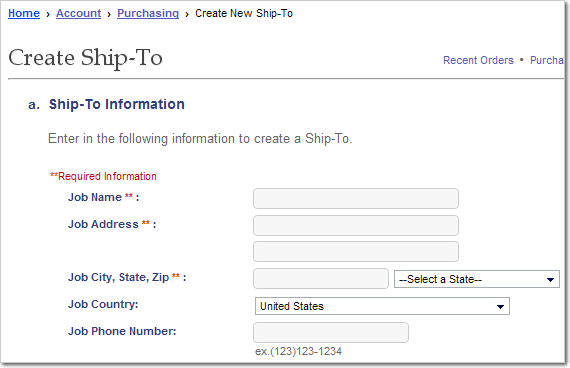 Enter the required delivery address information after selecting which subscriptions you would like to receive. Access the Invoice Preferences page through the Account Settings menu. This page allows you to fully customize what appears on your invoices as well as how they are delivered to you. Available delivery methods include receiving invoices by mail, by fax, through email (multiple addresses are allowed), and via EDI. First, select a Sub-Account from the drop-down menu. Different settings can be saved for each account. 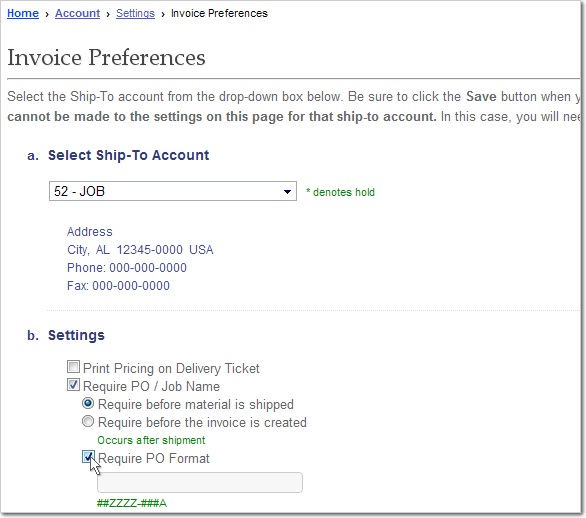 In the "Settings" section of the page, you can elect to: print pricing on delivery tickets, require PO/Job Names before shipment or before invoicing, set up a required PO Format to enforce standardized PO/Job Names, choose to allow back-orders, and/or print back-orders on delivery tickets. Changes to Invoice Preferences cannot be made if there is a hold on the selected account. Be sure to click Save when you are done. From Account Settings you may also manage your Statement preferences. This page allows you to specify how you would like to receive your monthly Statements and Summary Billing. Both may be received through email, mail, or both. The Email delivery method allows you to add as many recipient email addresses as you like. The Mail option will use your primary Bill-To Address and requires no further entry. Summary Billing is sent to you periodically and provides a consolidation of your recent invoices. 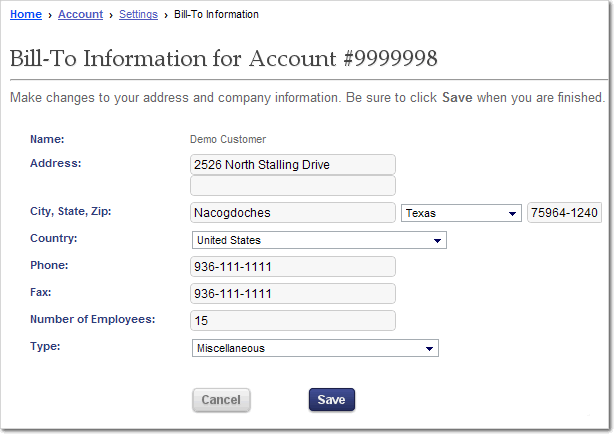 The Summary Billing setting requires you to select the desired Sub-Account from the drop-down menu. Changes cannot be made to Sub-Accounts with holds on them. Note that you can also check your statements online at any time, from the most recent statement to those from previous months and years, on the Statements page in Account Payables. 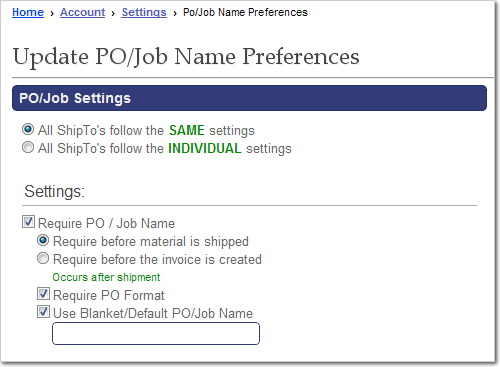 The PO/Job Name Preferences page offers you more expanded options for customizing your PO / Job Name requirements than what is found on the Invoice Preferences page. You are allowed to modify settings for ALL Sub-Accounts at once, or you may make job-specific modifications on individual Sub-Accounts. A key is provided on the page to explain the different characters and symbols that are available for use when creating PO formats. Certain characters/symbols represent optional numbers or letters, while others stand in place of required entries. Click the pencil icon near a PO Format to edit it. You are allowed to add multiple PO Formats and edit them however you like. Remember that whenever you choose to "Require PO Formats," any place where a PO/Job Name is entered on our website will require that your entry matches the defined formatting. You are allowed to set up hints, example PO Names, that will appear to assist you whenever you enter a new PO/Job Name. Each character used in creating a PO Format functions as a placeholder, or variable, representing a certain type of entry (numeric or alphabetic), which may be a required or optional entry. The only exceptions to this are the constant symbols (+ — / \), which are non-variable and should appear in the PO Name exactly as they appear in the format. 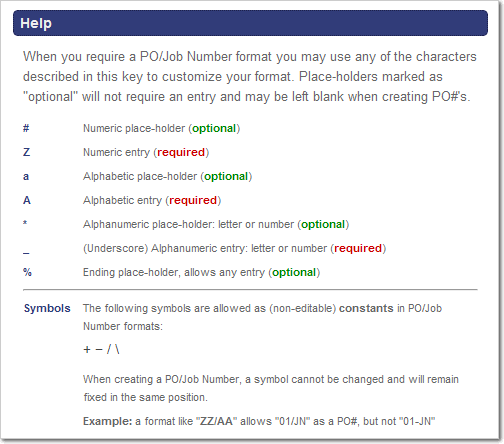 The full guide to characters and symbols used in PO Formats can be found at the lower left of the PO/Job Name Preferences page (shown above). Our Price File Requesting system has been moved from the Account Settings menu to the Purchasing portion of the Account section. 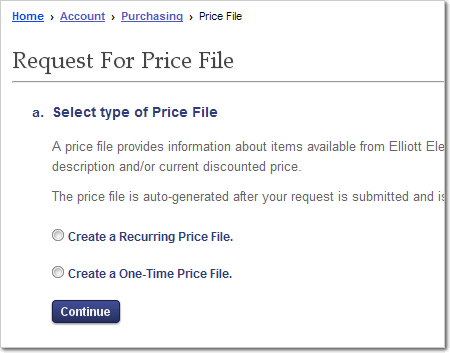 The Price File Request process lets you request either a one-time or recurring price file on items sold by Elliott Electric Supply. Choose to create a Recurring Price File or a One-time Price File. The only difference between the two request processes is that if you choose Recurring, the second page will include an additional Frequency setting that lets you elect to receive the recurring file either monthly or weekly. 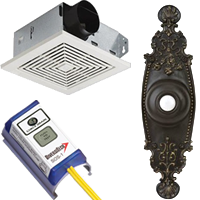 On the second page of the process, enter your email, preferred estimation software, and one of the following item sets: Last 12 month’s sales, Items with Discounts, or Most Common Items. Press the Submit Request button to start receiving your Price File. Our Sub-Account Creation process has also been moved from the Account Settings menu to the Purchasing portion of the Account section. The 'Create New Sub-Account' process involves four steps that allow you to setup a new Sub-Account. On the first page, you will enter the basic Job information. Not all of the fields are required, only the ones indicated by red double-asterisks**. The second step of the process lets you specify the Job’s General Contractor and Property Owner. You can choose from drop-down lists of contractors/owners used in the past, or you may enter new ones by clicking the 'Create New' link. On the third screen you will set the new Sub-Account’s Billing Options. By default, you will receive one invoice copy by mail, but you may request more. If you would like to receive Invoices by Fax and/or Email, enter the appropriate fax/email information. The final page will display a summary of all the information you have entered so that you can verify its accuracy. 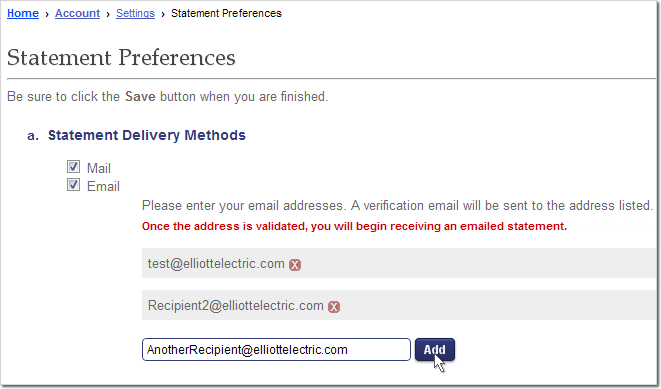 There is also a text box at the bottom for entering an optional message for your credit representative. When you are done, click the 'Submit New Sub-Account' button and the creation process will be complete and pending approval from your Elliott representative.